Starting today, there’s a new section on Reward Gateway’s website. You may have heard murmurings and a post here or there about something we’re really excited about: “Build it: The Rebel Playbook for World-Class Employee Engagement.” And while I’m counting down the days until February 2018 when it’s released, there are two people here that are more excited. Group Reward Director Debra Corey and CEO Glenn Elliott, a.k.a. the authors of "Build it." Watch the video below to hear what inspired the rebels to author the upcoming book, a look into who will be featured and how the book sales will help make the world (an even) better place to work. 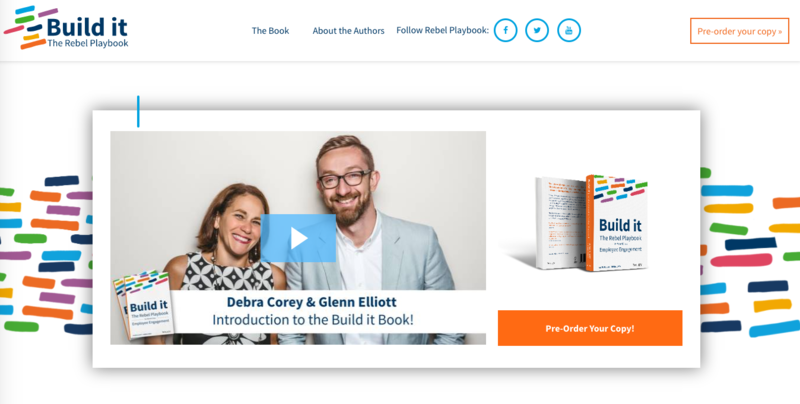 Click below to the Rebel Playbook section to find sneak peeks into their book, exclusive plays from the online “playbook” of world-class employee engagement. Leading up to the launch (and beyond), we’ll continue to feature video interviews with HR rebels and executive-level gamechangers from companies of all sizes, and tales of rebellion that span from before Glenn even landed his first job. Find it permanently under the Employee Engagement navigation in our main header. Don't forget to tell your friends, neighbor and even your favorite barista - The Rebelution has begun!